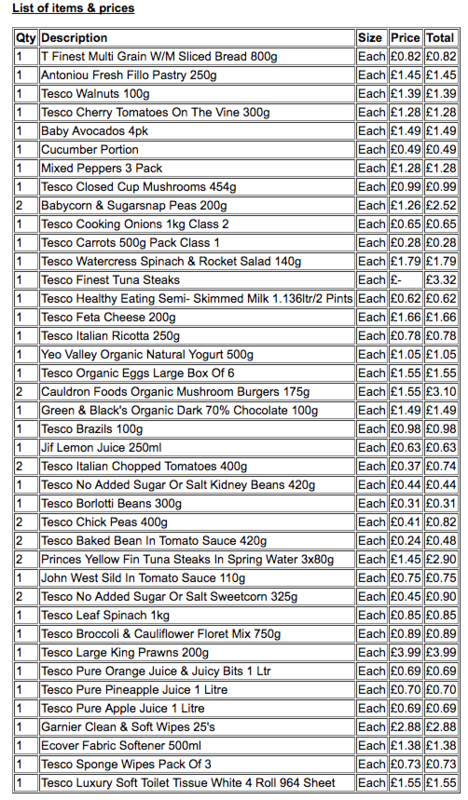 The other day when I got my Tesco grocery delivery, there was a £2.50 Tesco voucher to celebrate our 250th order. This got me curious to dig out the email confirmation from the very first order. It was 21 March 2005 – right after Gareth and I returned from our Vegas nuptials. The email read: I am pleased to say that you have done all the hard work – it gets easier from now on. Looking at the shopping list, it’s clear I had seized control of the menu. I’d only moved in with Gareth about a week before we got married and had yet to learn the fine art of compromise. The poor lad didn’t even get a packet of biscuits! While I appreciate Tesco’s oh-so-generous voucher, the geek in me wishes they could have used their creepy reservoirs of data to send us some statistics on those 12+ years of orders. I’d love to know what our consumption has tallied up to. 750 litres of milk, 138 kilos of potatoes, 1000 rolls of loo paper? Or 420 avocados, if not for which we could’ve paid off the mortgage? Both the history of a marriage and my rollercoaster relationship with food lives in those order emails. Gareth starting out as a vegetarian with occasional fish, before the siren song of the bacon lured him astray for a few years (these days he’s back in veggie town). Then there was the Total Greek Yogurt obsession. Gareth’s discovery of Mackie’s Haggis flavour crisps. The Whole30 that barely lasted a week. The Sainsburys Years in Inverness. The long dark stretch with the weekly tub of Haagen-Daaz, scoffed on delivery then evidence hidden in the bottom of the recycling bin. Then, the introduction of Ziggy (Gourmet brand cat food only, please. But not the salmon. Until her majesty changes her mind and demands Felix. Then back to Gourmet again. No, wait…). P.S. If you are at a loose end, here are some previous supermarket stories: Singing in the aisles. Riding the Orgasmatron. Stop the bus! The Joy of Jellyfruit. Congratulations on this important anniversary 🙂 When my partner & I moved in together, I also controlled the shopping list with an iron fist – which is odd seeing as he’s always done all the cooking! 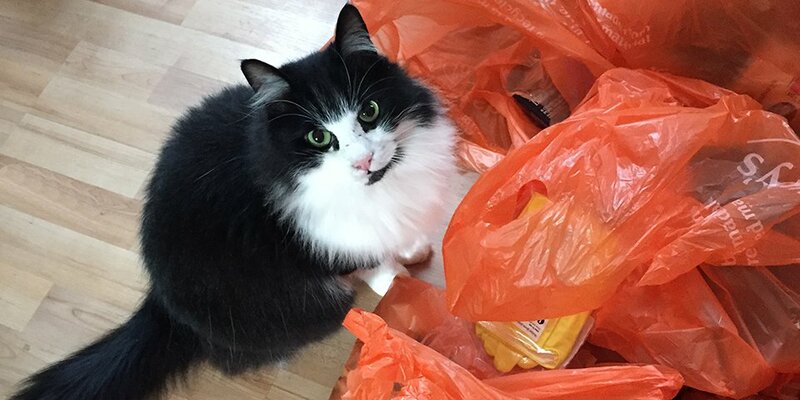 Now he has complete responsibility for the entire food situation & I’m happy about this – not least because he buys lots more treats than I ever would! Wow I bet that 2,50 GBP voucher made you glad you had stuck with Sainsburies for all those years 🙂 I would love to see some stats on groceries too – I have loyalty programs with some supermarkets and find it interesting to see what groceries they let me know are on special. I love your ideas of writing your life through the groceries you buy – at the moment there are a few too many crisps on our groceries but I wish they included those haggis crisps. The computer programmer in me is like, “If Shauna has the email receipts for all her orders, I could write a script to parse the results and analyze the data.” LOL! I’m sure Tesco has access to the data and uses it to try to sell you stuff. A few years ago I looked back at all my Amazon orders since 1999. Boy, does that tell the story of my life in weird ways! Yes! Let Jeanette analyse your shopping receipts. Enquiring minds want to know. I like how your only reward for that first shopping list is the green and blacks. What a paltry reward from Tesco. I reckon the supermarket loyalty program here is Oz is trying to modify my behavior – only telling me about certain shopping specials.